This is the Character Sheet for Nature Cat. 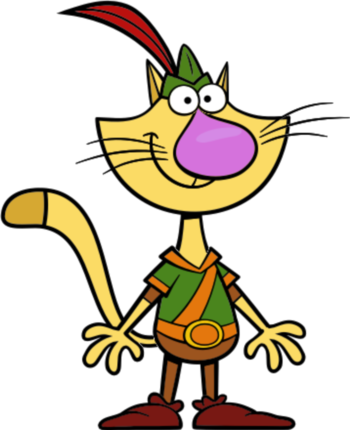 Nature Cat is a cat who fancies himself a dashing, swashbuckling explorer who cant wait to get outside for a day of backyard nature excursions! A passionate and curious feline, Nature Cat is a great friend who would do anything for his pals; hes always ready to show them an amazing time out in nature. 10-Minute Retirement: Nature Cat pulls one off himself in "Goin' Batty". He makes several mistakes along the way (including getting bitten by mosquitoes and touching poison ivy), eventually coming to the conclusion that he isn't fit to be Nature Cat anymore and should just stick to being a house cat. He's ultimately convinced to go back to his old self when he rests a while and discovers he does have good instincts. Ambiguously Gay: Let's see: He overdramatically fluctuates pitch, tone, and pronunciation when excited (i.e., a lot), is named Fred, plays the lute, and kisses Hal a lot. 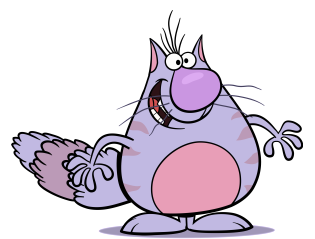 Anthropomorphic Zig-Zag: He's a housecat named Fred by day, but he turns into a Funny Animal when his owners are gone. Big Damn Kiss: Gives them to Hal. All the time. It's honestly a miracle that Moral Guardians didn't try to get the show off air because of this. Catch-Phrase: "Tally-ho!" and "Onward and yonward!" Cats Hate Water: This is one of Nature Cat's defining traits, and a recurring fear. He avoids water at all costs and panics whenever he gets splashed, though occasionally builds up enough strength to ride in boats. Is brought to a head in "Tide Pool Tough", where the entire plot is his determination to get over his fear of water in order to try surfing. Clark Kenting: When at home, Nature Cat is simply "Fred the house cat." However, this is only ever shown directly in the theme song; other than the 10-Minute Retirement in "Goin' Batty", it's never brought up in the show proper, even when the characters are out in the city or going shopping. Cute Kitten: He was very cute ◊ as a kitten. Female Feline, Male Mutt: Inverted. Nature Cat is a male feline. Fully Dressed Cartoon Animal: Nature Cat wears a shirt, hat, shoes, and pants, while his three friends are naked. Furry Reminder: Nature Cat has quite a few moments of notice where he shifts back into a more feral mentality, particularly with his fur fluffing when he panics and, of course, water. The Hero: Of the whole series. Nature Cat loves nature and does anything he can to help it. 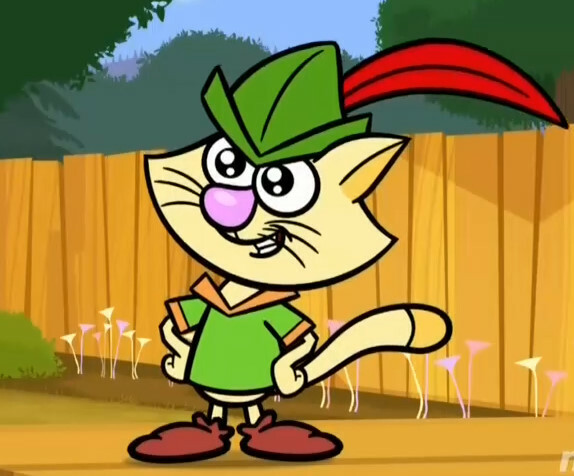 Iconic Outfit: Nature Cat wears an outfit that is very reminiscent to that of Robin Hood's. Large Ham: Nature Cat is known to speak very melodramatically. Nature Lover: Really? Who would have guessed? Rule of Symbolism: According to WTTW, who produces the show, Nature Cat is supposed to represent the majority of the viewers. Hes eager and enthusiastic about outside exploration and activities, but he is also a little clueless and even intimidated by it. Why Did It Have to Be Snakes? : Is very afraid of water. This is one wired-in rabbit! As a gadget lover, Daisy illustrates how technology can be helpful when out in nature — recording bird calls to help identify a particular bird or using the compass app to show which direction to go. Daisy asks A LOT of questions, and often weighs the options of anything and everything. Book Worm: More like smartphoneworm; Daisy often consults her phone to read up more detailed information about the episode's topic and is usually the most knowledgeable one. Bunnies for Cuteness: A very cute bunny. Girly Girl: To Squeeks' Tomboy. Only Sane Man: Daisy occasionally can be this. Phoneaholic Teenager: She's technically not a teenager, but she likes to use her smartphone a lot. Righteous Rabbit: She is very sweet and friendly. Rule of Symbolism: Word of God says that she is supposed to represent the viewers who have a hard time unplugging from their technological devices, yet are still excited to join the nature adventures. The Smart Guy: Easily the smartest character in the group. 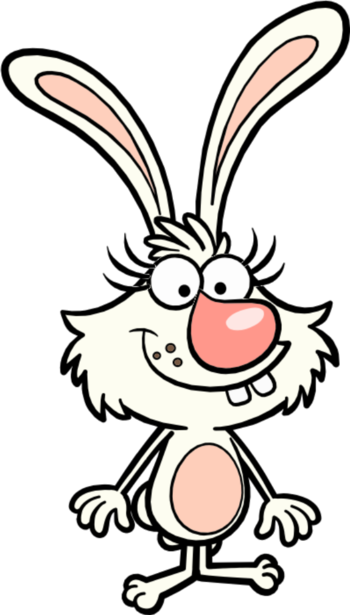 White Bunny: She has white fur. Youthful Freckles: Has what appears to be freckles above her mouth. This slobbery, disheveled, rambunctious family dog plunges headlong through life — running through puddles, digging up mud, and sniffing things that make Nature Cat shudder! Hes not the deepest thinker but is so optimistic he sees the good in everything. 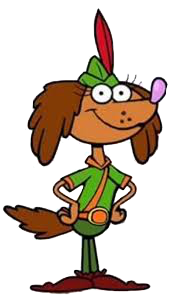 Ambiguously Gay: He is very loyal to Nature Cat, gets kissed by him all the time, and Hal says "O captain, my captain" sometimes to NC. Big, Friendly Dog: The tallest member of the gang, and while he is dimwitted, he is quite friendly. Big "NO! ": Says "NOOOOOOOO!" in "Moth-Frolic Fest". Catch-Phrase: "Hi X, it's me, Hal!" and "Me too too, also!" Department of Redundancy Department: Hal, all the time. It's even part of one of his catchphrases! The Ditz: Hal is the most dimwitted of the main characters. Dogs Are Dumb: Hal is a dog, and is very unintelligent. Failed a Spot Check: "Hal's Day Off" begins with Hal catching a toy and landing in the back of a truck, and completely failing to realize that he's riding in it at all even after he starts to move. Huge Guy, Tiny Girl: While him and NC are both way bigger than Squeeks and Daisy, it's especially noticeable whenever Hal (the biggest of the group) and Squeeks (the smallest of the group) are paired up. Kindhearted Simpleton: He may not be the sharpest tool in the shed, but is very friendly, optimistic, and loyal. Mad Libs Catchphrase: "Hi,___, it's me, Hal!" Motor Mouth: He never shuts up. The Pollyanna: Always stays optimistic no matter what. Rule of Symbolism: Word of God says that Hal represents kids who may be more impulsive and like to run wild but forget to stop and enjoy the view. Sick Episode: "Fall for Hal". Undying Loyalty: He always sticks by Nature Cat no matter what. Justified since he is a dog. on her instincts than her experience and knowledge. This mouse shows kids that no matter your size or age, you can always help out and make a difference. All Love Is Unrequited: She got a crush on Sir Galahad in Heartthrob Hamster, but it only went one way. 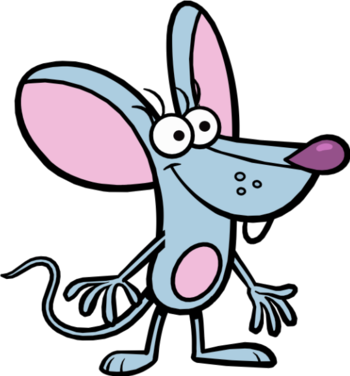 Amazing Technicolor Wildlife: Unlike the other characters, who have normal fur colors, Squeeks' fur is blue, though it may be intended to read as gray. Huge Guy, Tiny Girl: The Tiny Girl to Hal's Huge Guy. Interspecies Romance: Admittedly between two rodents, but between Squeeks (a mouse) and Sir Galahad (a hamster) in "Heartthrob Hamster". It technically only goes one way though. Little Miss Snarker: Definitely the smallest of the group, and is quite the snarker. She pretty much rivals Mindy Melendez at this point. Love Makes You Dumb: In "Heartthrob Hamster", Squeeks would say Sir Galahad didn't _____ as a Running Gag, only for Daisy to show her a counter-video that disproves her point, and shows that Squeeks' love of Sir Galahad is making her blind. My Nayme Is: Squeeks, not Squeaks. Nice Mice: Though she can be a snarker, she is otherwise sweet and friendly. Only Sane Woman: Squeeks typically serves as the voice of reason. Plucky Girl: Squeeks is fearless and idealistic. "Squeeks is at home outside, as many kids still are, and she is a great model for how fun, interesting and cool the outdoor world can be and how to share that with other kids." Tomboy: To Daisy's Girly Girl. Ronald is Nature Cats next door neighbor and arch-enemy. Hes a bit of a lazy feline, but is always up for some friendly competition, especially if its against Nature Cat. He likes to lounge in his hammock drinking lemonade or spend the afternoon at the groomers. He is also a DJ and spins at the neighborhood parties and events. Always Someone Better: Due to his competitive nature, he tries to invoke this on Nature Cat. Amazing Technicolor Wildlife: Most animals in the show are realistically-colored; Ronald is, well, purple. Big Bad: Most of the time, he causes the conflict, and also serves as the gang's rival. Cats Are Mean: Played straight. He's a cat and he is selfish and competitive. Competition Freak: Ronald is very competitive and always wants to beat Nature Cat at everything. Fat Cat: A very overweight feline. Becomes the focus of "The Legend of the Gold Gardens" where he proves to be too out of shape to climb a mountain, and only barely gets past the obstacles before it. Friendly Enemy: Whenever he partners up with the rest of the gang. Harmless Villain: For obvious reasons given the show's target demographic. He's more of a nuisance than a real villain, a bit of a selfish egotistical jerk. Jerk with a Heart of Gold: He may be NC's arch-enemy, but is still willing to help him out from time to time. Sidekick: Tried to be this to Gwendolyn in The Return of Bad Dog Bart, with failed results. Sitcom Arch-Nemesis / The Rival: To Nature Cat. 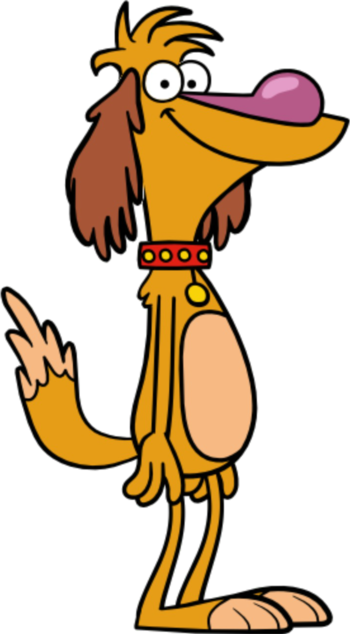 Nature Dog is the canine counterpart to Nature Cat. She debuts in the Made-for-TV Movie Ocean Commotion. She helps Nature Cat and his friends navigate the ocean. Distaff Counterpart: To Nature Cat. Female Feline, Male Mutt: Inverted. Nature Dog is a female canine.